Called a bouquet making machine, White Licorice has a bushy, well branched form that looks good in the garden. Light yellow to white. Strong, lemon, licorice fragrance. 35 to 40 petals. Average diameter 4″. 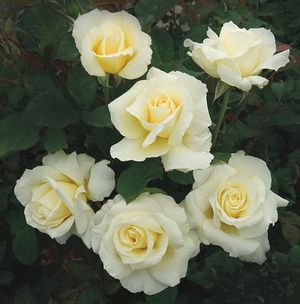 Medium to large, full (26-40 petals), borne mostly solitary bloom form. Continuous (perpetual) bloom throughout the season. Pointed, ovoid buds. Medium, bushy, upright. Medium, semi-glossy, dark green foliage. Height of 31″ to 47″ (80 to 120 cm).